Forest Garden 10 x 6 Overlap Pressure Treated Pent Shed: The Forest Garden 10 x 6 overlap pressure treated shed has a pent style roof which means there is more height to the front of the shed for easier access in with bigger items. This shed has an overlapping rough sawn timber design, the timber has been square cut to allow for rainwater to run off the sides and the wood used is FSC certified from a sustainable source. The shed is nicely finished off with smooth planed finials and barge boards and a shed felt roof covering. This shed benefits from a robust pressure treated boarded floor and an OSB sheet material roof. There are a number of security features on this shed including polycarbonate glazing which will not break or go brittle and security screws to hold the windows in place, a single door with double Z framing, hidden door hinges and a hasp and staple lock. This shed has a pent style roof which means there is a single slope going backwards to enable high head room to the front of the shed and will allow rainwater to run off the back. Your new shed will be delivered in easy to handle sections and is straightforward to put together when being built by at least 2 people. NB: This Timber has been pressure treated in the factory which will give the wood a darker appearance. 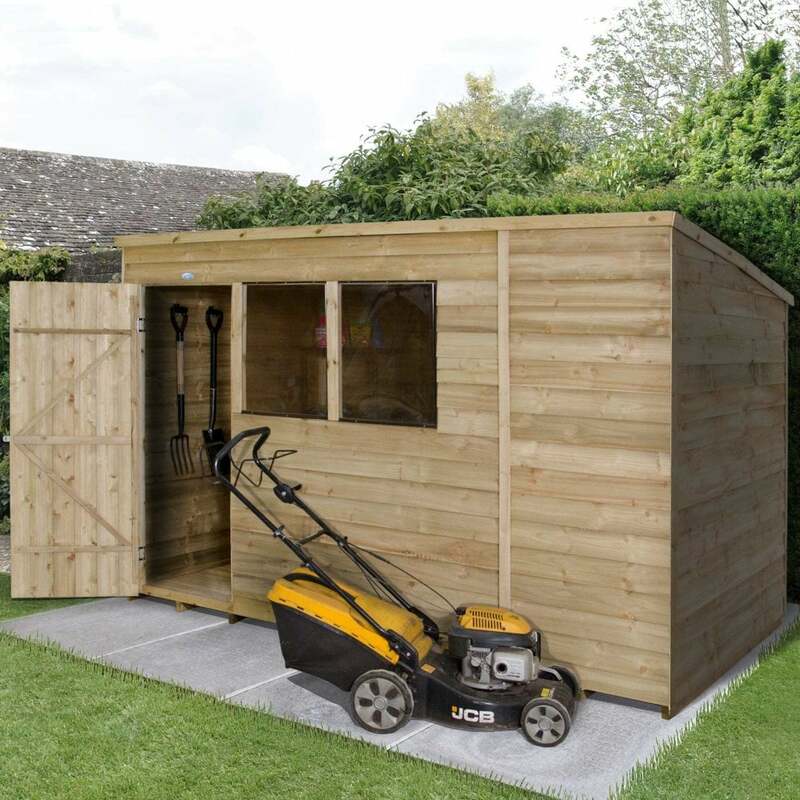 The Shed is guaranteed against rot and fungal decay for 15 years – there is no need to treat it once erected. View our full garden shed and log cabin range online.